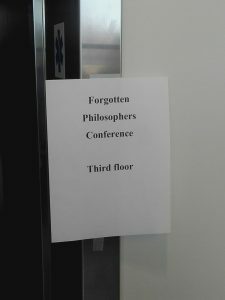 Granted, however, that there is definitely some sort of value in remembering forgotten figures of philosophy (which is hard to deny if one does not think of him- or herself possessing absolute knowledge already), more problems arise when one tries to organize such a conference: Who counts as a forgotten philosopher at all? (In a certain sense, even Kant, Plato, and Hegel might be “forgotten philosophers”.) Which forgotten philosophers are more worth being remembered than others? (Since due to obvious practical limitations not all can be remembered.) And does the notion of “forgotten philosophers” include figures which have never been even noticed? 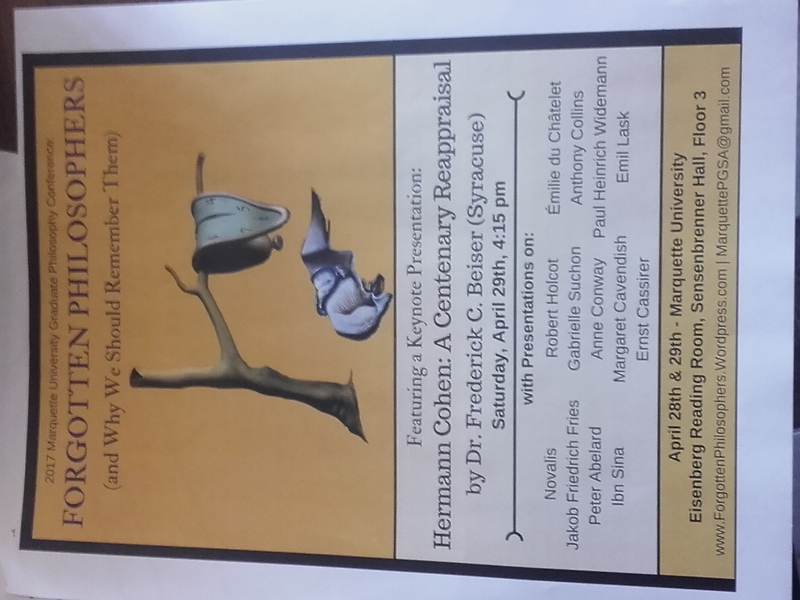 No philosophy conference without ambiguities! 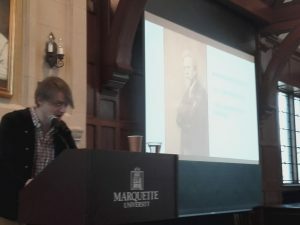 Well aware of all these issues (Clark Wolf cited Nietzsche in his introductory remarks), the organizers of the conference chose a rather pragmatical approach: They picked philosophers from periods of time which many graduate students in Marquette work on and which are forgotten from the point of view of Marquette’s philosophy department. A reasonable approach – which seems to show again the necessity of setting at least some boundaries to remembrance that are arbitrary in the last instance. 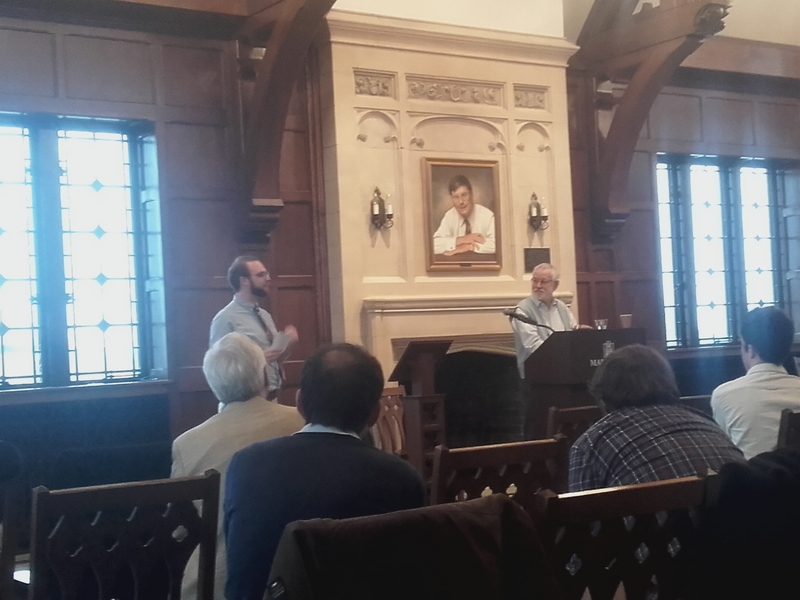 The conference focused, thus, on medieval philosophy, early modern philosophy, classical German philosophy, and 19th and 20th century German philosophy. 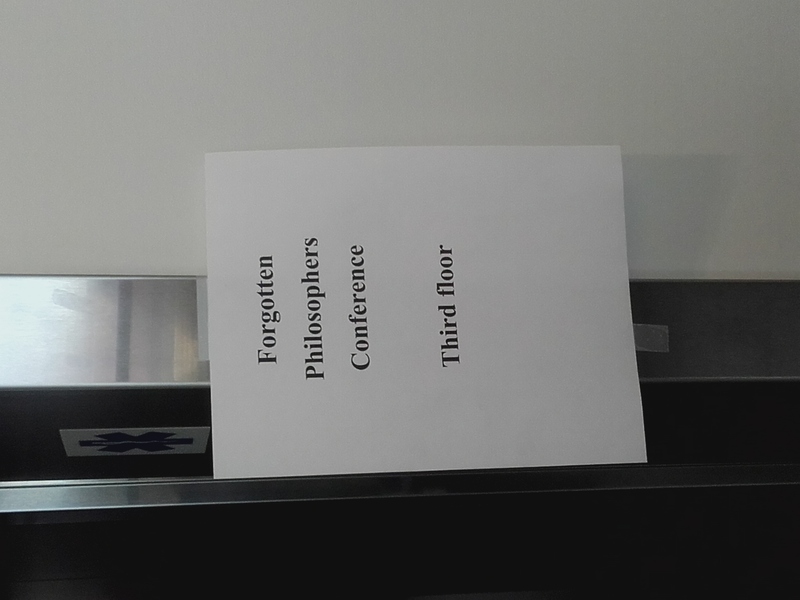 This rather broad scope of the conference (obviously suggested by its topic) implied another problem: Nowadays, research in the history of philosophy is highly specialized and one can be lucky if one possesses a good overview over even one single philosopher. Most scholars work on rather detailed issues and most conferences focus on a single philosopher – and, if not, at least a rather specific topic. Of course, there are some prominent figures of the history of philosophy everyone should know somehow and some classical questions everyone should have heard of during his or her studies. Thus, in most conferences the present scholars understand each other more or less: They work on similar topics, refer to a shared canon, or are experts on the same period or the same philosopher. In the case of this conference, none of these requirements existed. To state it directly: It was very difficult for me to understand even the basic ideas of some of the talks on medieval and early modern philosophy because these are the very areas of the history philosophy I am less familiar with. I have come across some bits of Aquinas and Anselm of Canterbury – but you would not call yourself an experienced explorer of Europe if you have been to Rome and Dublin for one day, would you? 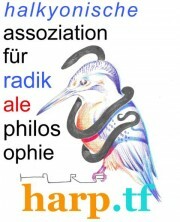 It was easier for me to follow the talks on German philosophy – but even they were challenging to follow simply because they addressed philosophers so little discussed even in Germany itself (I have to admit that I haven’t even heard the name Jakob Friedrich Fries before for example). These problems have not been unpredictable, however, and I am very sure that everyone present in the room faced the same difficulties. Thus, I have to say that everyone should have put more effort in make his or her paper accessible to a wider audience – and to take the question posed in its title (why we should remember them) more seriously. Most speakers seemed to have given simply their standard talk which they would have presented at any conference. Simona Follini gave her talk using skype. On the table: Clark Wolf, the conference’s main organiser. But let us not to be too quick in our judgement and let us see if there was still some sort of value in this conference. I have to admit that I could not understand much of the talk of Simona Follini on Abelard’s Answer to the Problem of Universals. Celia Byrne’s talk on Rethinking the Relationship between Essence and Existence in Ibn Sina’s Metaphysics, however, was hard to follow as well but defended an interesting claim: That essence and existence are logically connected, that existence, thus, is logically primordial to essence. The main motive for Ibn Sina’s considerations seems to be a surah of the Qur’an in which it is implied that things existed before Allah created them – thus, while Allah’s will created their essence, their existence must somehow precede it. This idea induced an interesting discussion between me and another student later relating this medieval debate to the modern struggle between idealism and realism: From an idealist point of view, the idea of an existence primordial to a thing’s essence would be absolutely non-sensical, while from a realist one this would make perfectly sense. It was interesting to see that medieval philosophy addressed the same question, even if in a very different terminology and style. 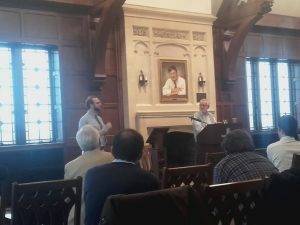 I had a similar experience with Mark Boespflug’s talk on Robert Holcot on Doxastic Voluntarism and the Ethics of Belief. Against the mainstream position of his time, Holcot argued that we are not responsible for our believes but the power of evidence forces us to believe them. This was obviously a dangerous position during that period since if this is true non-believers could not be hold responsible for their disbelief any longer. But also in our modern time while many of us doubt if one could fully hold responsible for one’s actions, few would claim the same for one’s beliefs, which are viewed as a realm of more or less pure freedom (cf. the famous German song Die Gedanken sind frei, Thoughts Are Free) – we could not punish “thoughtcrimes” any longer. Interestingly, the subsequent talk by Scott Cowan on The Force of the Fragment. Nine Paragraphs on Novalis’ Selection of Genre took up the same question, the nature of thought. Also for Novalis thought should not be seen as something we do voluntarily but as a living, natural force. Cowan did not only seek to present Novalis’ thoughts about thought, however, but to present his manner of thought by speaking in fragments himself. This unusual experiment in an academic surrounding posed the obvious – and: important – question what we lose when abstracting a philosophy from the style in which it is written to a very standardized scientific vocabulary and way of presentation. It may be a more adequate way, indeed, to try to explore a philosophy by imitating its style, thereby grasping its inherent “sound” in a very concrete manner. From Tadahiro Oota’s talk on Jakob Friedrich Fries’ Conception of ‘Critique of Pure Reason’ I learnt that Fries was one of the many who tried to complete Kant’s project in the first half of the 19th century. He did this by defining philosophical methodology as the analysis of everyday opinions. Although neglected in his own period of time, Fries might be seen as a forgotten predecessor of analytical philosophy. 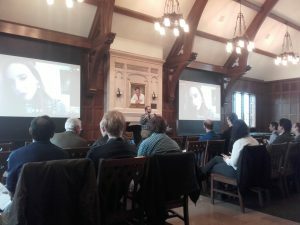 The three talks on early modern philosophers – that one by Nick Nash was canceled – had in common that they talked about female philosophers. Mathieu Baril presented the French philosopher Gabrielle Suchon who developed an early notion of feminism based on Descartes’ philosophy. Apparently, there was a large number of proto-feminist literature in 17th century France that was inspired by Descartes’ philosophy of spiritual freedom – which obviously implies that all human beings possess the same soul despite their bodily differences. Thus, an interesting link can be made between Descartes’ metaphysics and a certain political agenda that still resonates in modern liberal feminism. Aaron Wells presented the metaphysics and epistemology of Emilie Du Châtelet who tried to develop a third way between rationalist idealism and realism. Haley Brennan presented with Anne Conway and Margaret Cavendish two female philosophers who were strong critiques of Descartes’ dualism and proposed a more fluid and interactive relationship between body and soul, mind and matter. Brennan implied, referring to Genevieve Llyod’s book The Man of Reason, that this should be seen as a feminist critique of a patriarchal down-grading of emotions and the body. Baril’s and Brennan’s talks pointed, thus, to very different possibilities of defining feminist philosophy: While Baril presented Suchon’s strict Cartesianism – in which there was no room for the body – as an early notion of feminism, Brennan would see exactly this Cartesianism as opposed to feminist aspirations. Myself. In the background: Paul Heinrich Widemann. The last four talks centered on late 19th and early 20th century German philosophy. In my own talk, I presented the philosophy of Paul Heinrich Widemann, a completely forgotten (one may even say: unnoticed) student of Friedrich Nietzsche. 1)This research has been funded by a fellowship granted to me in 2017 by the Stiftung Weimar Klassik. Slightly similar to Conway and Cavendish he tried to develop a conception of embodied subjectivity against Descartes’ and Kant’s dualism. At the same time, however, he tried to defend a kind of rationalism. This makes his philosophy a rather awkward combination of rationalist and naturalist impulses. Contrary to all other speaker, I therefore decided not to defend that Widemann should be remembered: His philosophy is simply not very consistent. Moreover, it is clearly connected to Widemann’s anti-Semitic and nationalist views that he expresses on other occasions. Roberto Redaelli gave a very interesting talk about Emil Lask’s philosophy. While others see Kant as the founder of constructivism, Lask tried to develop a realism taking Kant as a starting point. Lask stressed that the forms of cognition have to be seen as objective forms which lie in the objects themselves. They are not recognized by discursive reasoning but by non-discursive, intuitive cognition. In order to describe this mode of recognition Lask developed the notion of Hingabe (“devotion”). Arthur Kriger spoke about Cassirer’s Theory of Dipolar Perception. (Especially in this case, one may wonder from a German point of view if Cassirer counts as a forgotten philosopher at all.) He presented Cassirer’s idea of two layers of perception, the I- and the object-pole, which both together constitute the totality of one’s world: Spatial and temporal objects on the I-, a world shared with other beings similar to myself on the object-pole. Frederick C. Beiser and Clark Wolf. 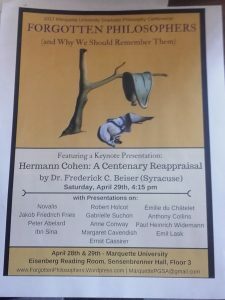 In his keynote, the distinguished scholar Frederick C. Beiser spoke about Hermann Cohen who died almost one hundred years ago, in 1918. Cohen was the founder of the Marburg school of neo-Kantianism. One of his main teachings was that everything has to be justified – i. e. that there can be no dogmas in philosophy – and that this procedure of justification is limitless. He excluded every notion of passivity and objectivity in Kant, which he viewed as inconsistencies. He also developed a philosophy of religion in which he stressed the need for a realization of the promise of religion, peace and justice, in this, not in a higher world. Jews should spread this inner-wordly conception of the “kingdom of God”. Against historical materialism he developed an ethical socialism similar to Eduard Bernstein’s. He saw Kant’s philosophy as the foundation of socialism. Beiser himself acknowledged the many flaws of Cohen’s philosophy, namely the thread of fruitless skepticism and the question of the origin and justification of the content of reason itself. He praised, however, the strong ethical and political integrity of Cohen. III. Has it been useful? To sum up, one has to admit that, despite all difficulties, it has been a most interesting conference. I have learnt a lot about philosophers I have hardly heard of before and many relevant questions have been addressed – although I do not know if I will deepen my knowledge of any of the philosophers discussed in the near future. At the same time, the conference indeed showed the fragmentation of philosophical discourse and the difficulties in overcoming it – a general answer why we should remember forgotten philosophers cannot be deduced from it. Maybe everyone has to find his or her own answer to that question. For me, at least, the most interesting aspect of the conference was the relationship between certain philosophical positions to political perspectives. While some talks addressed this question only very indirectly, others tried to link rationalism to favorable or unfavorable politics. This question is of high relevance today: While most leftists seem to follow a track laid out by Descartes, Suchon, Kant, and Cohen, others would prefer Novalis, Nietzsche, Conway, and Cavendish. I myself tried to argue in my talk that the reactionary part of Widemann’s thinking is precisely linked to his rationalism – others would probably state the opposite. Indirectly, this has much to do which my introductory reflections: While it would be a rationalist position to remember as much as possible – which is linked to a certain ethics and politics of inclusion and equality –, from an anti-rationalist point of view this idea seems to be opposed even to critical politics. A question that remains to be solved and definitely should not be forgotten. 1. ↑ This research has been funded by a fellowship granted to me in 2017 by the Stiftung Weimar Klassik. Paul Stephan veröffentlichte diesen Artikel am Dienstag, 24. Juli 2018, um 06 Uhr 46. Kategorisiert unter Articles in English, Geschichte, Highlights, Philosophie, Religion, Tagungsberichte, Wissenschaft. Schlagwörter: Aaron Wells, Abelard, Analytische Philosophie, Anne Conway, Anselm von Canterbury, Arthur Kriger, Celia Byrne, Clark Wolf, Deutscher Idealismus, Eduard Bernstein, Emil Lask, Emilie Du Châtelet, Erinnerung, Ernst Cassirer, Feminismus, Frederick C. Beiser, Friedrich Nietzsche, Frühe Neuzeit, Gabrielle Suchon, Genevieve Llyod, Geschichte, Geschichtsphilosophie, Haley Brennan, Hermann Cohen, Ibn Sina, Immanuel Kant, Islam, Jakob Friedrich Fries, Konferenz, Margaret Cavendish, Mark Boespflug, Marquette University, Martin Heidegger, Marxismus, Mathieu Baril, Milwaukee, Mittelalter, Neukantianismus, Novalis, Paul Heinrich Widemann, Philosophiegeschichte, Positivismus, Realismus, Rene Descartes, Robert Holcot, Roberto Redaelli, Scott Cowan, Simona Follini, Tadahiro Oota, Tagungsbericht, Thomas von Aquin. permalink. Folge Kommentaren hier mit dem RSS feed. Hinterlassen Sie ein Kommentar oder hinterlassen Sie ein trackback.